Itopia bills the partners one month in advance. The billing date depends on the day you subscribed or did an upgrade of your itopia plan. You will be billed the same day every month and your statement will be sent to the company email address. If the the yearly billing was selected in one of the past offers, the same is valid in yearly cycles. If you subscribed to itopia using Google Marketplace, your GCP and itopia bills come bundled together in one invoice. The date of the monthly payment depends on the date you subscribed to GCP. If you subscribed to GCP and for itopia the same day, that would be your billing date every month. If you already had a GCP account when subscribing to itopia, the billing date will remain the same for you and the itopia cost would be added to your bill. 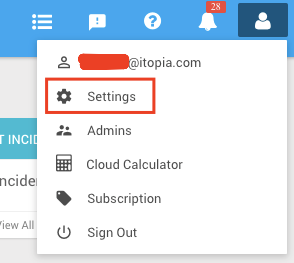 To confirm the email address the statements are sent to, login to itopia CAS and click on the person icon in the top right corner - click on Settings and look at the company details in the COMPANY tab. The email listed there is the one that receives the billing information. If you want to edit your company settings, you can do so clicking on the pencil icon next to the Legal business name. After clicking the pencil icon, you will get an option to add another billing address so any billing related information can go to both, the main Email address and the additional Billing address. If you cancel your itopia subscription, your access will remain active until the end of your billing period (the period you last paid for) and your GCP resources can still be accessed via the Google Cloud Console. Billing for Google infrastructure can be managed from Google Cloud Console.